It's been a long time, but worth it. As we sat cuddling our newborn son in the hospital, it was with mixed emotions we watched on the TV local news as the Africa Mercy sailed out of the port of Blythe. Joy, that at last the Africa Mercy is ready to do what she is called to do, healing the poor and needy and sadness, that we were not able to be present after investing so much in the project (but Nathanael made up for that!). 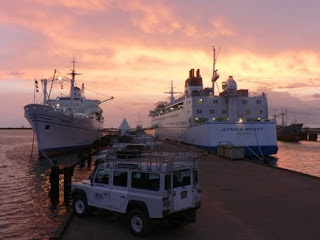 After a PR stop at Rotterdam, the Africa Mercy continued on towards Tenerife for refueling and underwater survey and then onto Liberia. It wasn't the smoothest of sails with hitting very strong winds at the bay of biscay (Tim calls it the "bay of dismay" as it is reknowned for bad weather), so as you can guess there were a few things that came crashing down as people discovered they hadn't tied things down too well. All in all they arrived safely and were greeted by the Anastasis crew as they prepare to transfer all the Anastasis equipment to the Africa Mercy ready for the Liberia outreach. Please pray for all that are involved in this transition. From the top of the gangway on the Africa Mercy, snaking from one ship to the other, a colorful array of crew and board members of over 35 different nationalities lined the dock. All standing together, in unity, to celebrate the passing of the torch. Beginning the ceremony on the opposite gangway, Dr Gary Parker raised the cross from the Anastasis bow high above his head. Forever going before us, the cross is passed from one hand to the next; it too will lead us at the front of the Africa Mercy. Behind the cross follows the torch. Beautifully crafted and burning brightly in the morning sun it is a symbol of past and future; made up from the different ship: teak from the Caribbean Mercy, Oil separator sleeve from the Anastasis and a small wooden cross from the bearing on the Good Samaritan [Island Mercy].